"Join Angela Anderson as she demonstrates fun and fabulous fabric painting techniques! 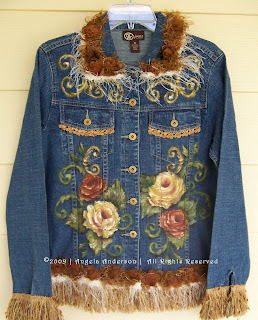 In this awesome video with Angela, you will learn how to take your fashion from drab to fab in no time at all with rusty roses on a demin jacket! Mix a little painting with a few embellishments and bada-boom-bada-bling! Angela will show you how to be boutique-chic on a budget! 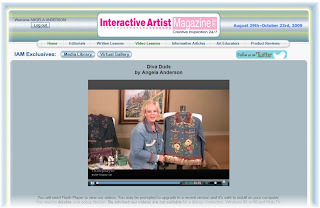 You'll also want to watch for Angela's upcoming fabric painting column in Quick & Easy Painting magazine in 2010!" For those of you new to Interactive Artist Magazine, it is an online magazine where artists subscribe and have access to articles, video lessons, written instructions and more! 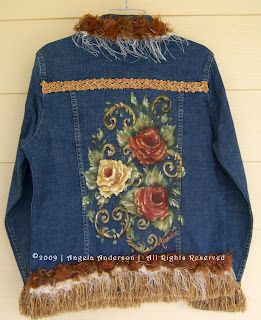 In this video, you will learn to paint this jacket!